Freebies like continental breakfast and comfy accommodations are the key perks at the economical Red Roof Inn Rock Hill which offers rock-bottom rates and an interstate location that's 15 minutes from Carowinds theme park. 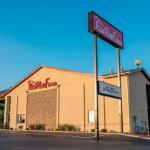 Red Roof Inn Rock Hill offers 76 simple rooms equipped with available Wi-Fi cable TV with premium channels microwaves and mini-fridges; larger rooms have sofa beds and/or jetted tubs. Fax and photocopying facilities help working guests take care of business. A 24-hour reception desk and vending machines are on-site. Parking is available for an additional fee and pets are allowed. Red Roof Inn Rock Hill is off I-77 five miles from downtown Rock Hill. Winthrop University and Piedmont Medical Center are both four miles from the hotel and excellent fishing and boating are five miles away at Lake Wylie. Baseball fans catch games at Charlotte Knights stadium which is 15 minutes up the interstate. Kids love the Paramount Carowinds Thrill Park which is a 15-minute drive and golf enthusiasts can hit the links at Pinetuck Golf Club 20 minutes away. The property is 22 miles from Charlotte Douglas International Airport.